You know those times when you just want a little something to snack on? Like, you don’t need an entire protein bar, but you want a few bites of something tasty and satisfying? I have a lot of those times — before I go to the grocery store, when I’m beginning to prep a meal that’s going to take a while, when I’m back from a workout and I’m not quite ready to eat anything substantial … the list goes on. And guys, I may have found my perfect snack. 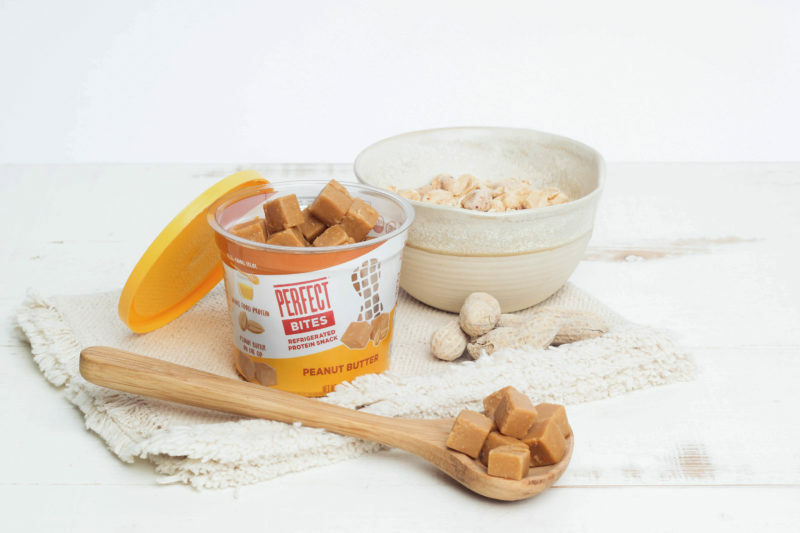 Perfect Bites, the newest offering from the makers of the Perfect Bar, are little bite-sized squares of goodness that are reminiscent of peanut butter cookie dough. Each cup has four servings (although I ended up getting more since I only grabbed a few each time), with each full serving offering 7 grams of whole-food protein. They’re vegetarian (although not vegan), gluten-free and soy-free, and although they should be stored in the fridge, they’ll last a couple of days at room temperature in their resealable container. You’ll recognize everything on the ingredient list, and you’ll also appreciate the fact that the packaging is recyclable. Shortly before I received samples of these to review, I picked up some other peanut butter bites at my local Lucky’s Market. They were delicious! And made locally! And they were also, like, $10 for … not very many bites. So, the price point of $6 per Perfect Bites snack pack (when you buy four of them, anyway) seems like quite the deal. As a huge peanut butter fan, I preferred the straight up Peanut Butter flavor, but I would happily pop a few of the Chocolate Chip Peanut Butter Bites, any time. And clearly, I’m not the only fan — I finished the samples that were sent to me and, when I tried to order more, found that they were out of stock! I’ll keep checking to see when they’re once again available, and, in the meantime, I guess I can always grab a Perfect Bar and cut it up into bite-sized pieces, right?